I've been tagged by the incredibly talented Vicky Guile...check out her blog. 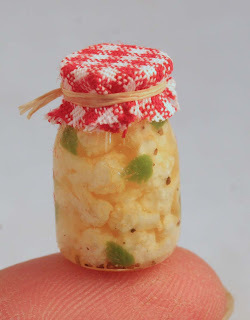 http://njdminiatures.blogspot.com/ Here you can marvel at Vicky's wonderfully imaginative creations. The way this works is that you now "tag" 6 of your favourite blogs & refer back to the one who "tagged" you....I hope you find it easier than me(for some reason it takes me hours to get the link right!!). Then list 6 things that make you happy! 1. Working in the garden in sunshine with my iPod to sing along to. 2. Spoling my 3 grandchildren & then handing them back to their parents! 3. Walking with my dog for company. 4. That "Eureka" moment when a mini I'm working on decides to turn out the way I envisioned it! 5. Eventually climbing into bed with a bar of Galaxy, a cup of tea & a bloodthirsty book! 6. Getting out of bed in the morning without aching somewhere! Then all that's left is to "tag" 6 bloggers by leaving a comment on their blog to let them know they've been tagged! Now I have to find them! At LAST! 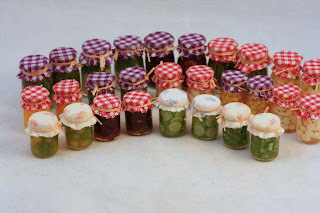 I have finally finished those 46 jars....nearly 2 weeks later working night & day at them. If I ever see another jar within the next 6 months, I think I'll throw it at somebody!! I really didn't believe that it could take so long to do them, but you may or may not have noticed that I have a bit of a problem....I'm a perfectionist! That has meant that each & every jar was painstakingly filled with individually made pieces, whether it be asparagus or chickpeas!! Oh dear, sometimes I really do despair of myself! Why, oh why couldn't I just have made a "resemblance" of each item..after all they were going to have coloured resin addded so surely the detail didn't matter? Sorry to say, as far as I was concerned if they were going to be attributed to me, Yes, the detail mattered...even if it drove me nuts!! This represents just under half of them! 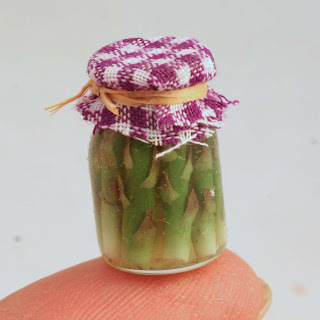 This asparagus jar might just show what I mean! If not, how about the cauliflower?! 28 pictured here with another 18, at this stage, nearly completed! 26 jars completed....only 20 to go!! 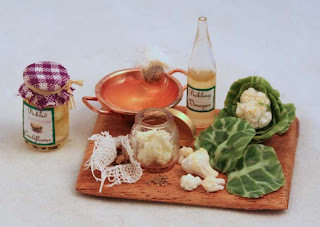 I can only last so long on this mind numbingly boring pursuit so, using a spare jar of pickled cauliflower (I mistakenly made 3 instead of 2..if I had a brain, I'd be truly dangerous...but no fear of that!! 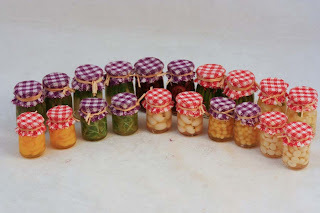 )I put together a "little" pickling set!....you've no idea just how much I enjoyed doing it! BUT...it's back to the endless jars tonight!! It has been a pretty unpleasant couple of days since I got home from Al Ain, apart from my leg which is definitely letting me know that I have hurt it, the fact that my black labrador & I have both had to get used to not having my springer spaniel anymore as, at 16 & failing very rapidly, she was put to sleep while I was away & almost as bad, an order to fill 46 little jars of 21 different pickled veggies & jams....can you hear me sighing? !There is nothing worse than "having to do" something & I really fancied making some of the fabulous sweet cakes that the Emiratis love so much....the photos I took for reference are shouting at me from my workbench as I'm tediously making hundreds of cherries, eggs, green beans asparagus....you name it & I'm having to make it!! I was so fed up last night with rolling thousands of chick peas (enough to fill 2 jars...now that's a whole lot of chick peas!! 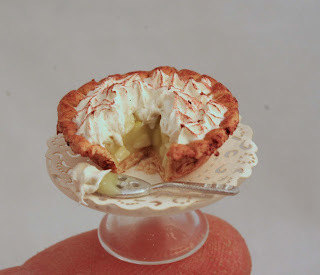 )that I went off on a tangent & made an apple meringue instead! Perhaps it was my way of stopping myself from actually heading to the kitchen cupboards & stuffing myself with "real" calories to keep me sane? Then I made the fatal mistake this afternoon of checking into Sumaiya's mini food blog & there were the most fantastically tempting cookies & cake from Kim Saulter...guess what...3 choccie biscuits & a caramel chunky kitkat later....I'm blaming Sumaiya for the extra lbs that I put on every time I check into her blog! woman eating London underground escalators! Well, here I am back from my exploits in "the desert" & not a mini to show you! I had a lovely time out there...it was so good to have warmth & sun day in & day out! Back in good old Durham, it has been a surprisingly pleasant day today & I have managed to cut the grass & clean the 10days worth of dust from every surface in the house.."He who shall remain nameless" has managed to conquer working the hoover, but polishing seems to have got the better of him! :-))I suppose I shouldn't expect too many miracles! After a very long day traveling I was within 50 yards of fresh air & a much anticipated ciggie.....yep, shock, horror...I SMOKE!!!! 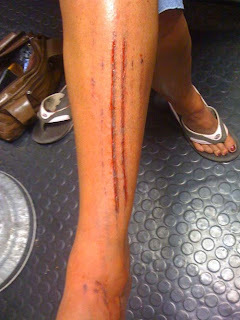 When the escalator taking me out of the bowels of London to the air in Kilburn decided to eat me!! I was actually very lucky as once your balance is gone on those damned things, it's impossible to get it back!! Luckily a gentleman behind me managed to haul me back to my feet before too much damage was done. I have no idea how it happened...one minute I was standing there minding my own business & anticipating lighting my 1st ciggie in 11 hours & the next it was as if I was literally on ice & no matter what I did, I just couldn't get my feet back where they should have been! So....everyone BEWARE there are man-eating escalators at large in London! !